Entry of endotoxin (lipopolysaccharide (LPS) or lipid A) into the blood stream is causative for the emergence of sepsis and septic shock with all its pathophysiological consequences.1 Serum contains a whole variety of proteins that interact with endotoxin. As large as the number of different proteins interacting with endotoxin, as broad are the consequences of these interactions. Serum proteins can either enhance cell activation by endotoxin or attenuate the cellular response, they can detoxify and eliminate endotoxin from the blood stream. In this chapter we summarize work on the investigation of the interaction of endotoxins with serum proteins. In four paragraphs we focus on proteins involved in the endotoxin-induced immune cell activation, detection by immunoglobulins, the transport of endotoxins and on proteins and peptides with the capability to neutralize the biological effects of endotoxin (Fig. 1). There is a multitude of studies analyzing the interactions between serum proteins and endotoxins, however, with great differences in the source and quality of the endotoxins used. The number of studies dealing with chemically well defined endotoxin structures are quite limited. 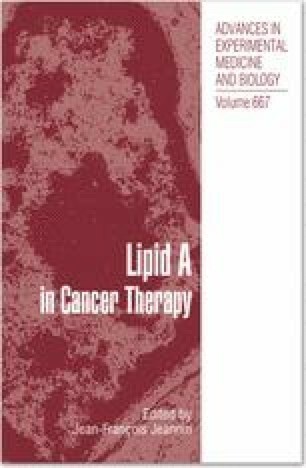 In addition, though lipid A is the biologically active entity, the “endotoxic principle”, of LPS, the majority of studies was performed with LPS. Therefore, to be comprehensive, we included also studies dealing with LPS and not with lipid A if fundamental scientific problems were addressed. 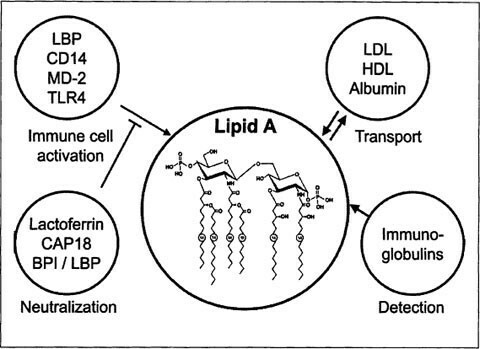 In that cases, we have to be aware that there may be differences in the protein interactions of lipid A and LPS, and we tried to emphasize this point in the respective paragraphs. Overview over the lipid A interacting protein groups described in this review. LBP, lipopolysaccharide-binding protein; TLR4, toll-like receptor 4; LDL, low-density lipoprotein; HDL, high-density lipoprotein; CAP18, cathelicidin cationic antimicrobial protein 18 kDa; BPI, bactericidal/permeability-increasing protein.